Cyclists head to Key West's annual Zombie Bike Ride along the island's Atlantic Shore. Chaya Donne, Crystal Downs and Jim Koch are tourists who came to Key West for Fantasy Fest, including the Zombie Bike Ride on the opening weekend. Carol Christman of Key West was dressed as the iconic Southernmost Point buoy, complete with gray patch representing the area where Hurricane Irma scoured off the paint. 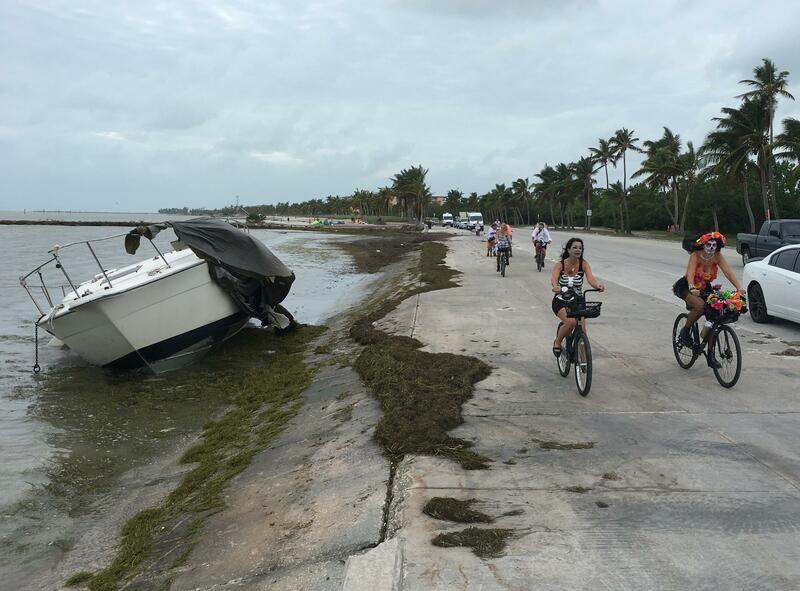 Most visitors reach Key West by driving down the Overseas Highway — where they will see evidence of the damage a Category 4 hurricane can bring. It only took a couple weeks after Hurricane Irma for the Florida Keys to declare the islands officially open for tourism again. And now the island chain's biggest industry is trying to rev back up with its biggest annual event — even as some areas are still dealing daily with the impacts of the storm. 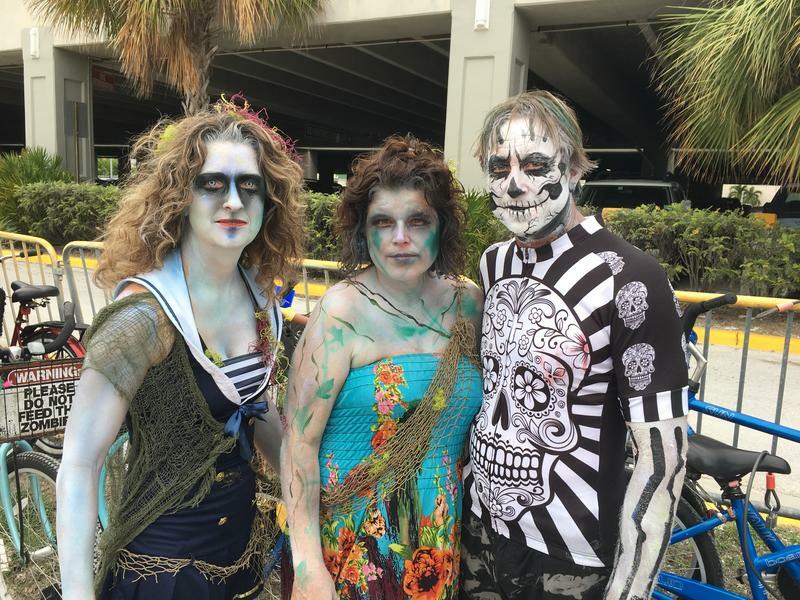 The Zombie Bike Ride takes place on the Sunday of the first weekend of Fantasy Fest, a 10-day series of costume parties and parades that culminates with a big parade down Duval Street that usually draws tens of thousands of tourists. Fantasy Fest was started almost 40 years ago. The Zombie Bike Ride is a more recent addition, but it grew quickly and attracts thousands of riders in every interpretation imaginable of zombie attire. This year's was no different, with an estimated participation of more than 6,000 people. Most of them were locals. But not all. "We come every year. This is my 23rd time down here" for Fantasy Fest, said Chaya Donne, who was at the Zombie Bike Ride with two friends, also visitors to the island. "This year especially, even if Fantasy Fest wasn't happening, we had to be here. We had to show some love to the Keys." Her friend Crystal Downs drove the Overseas Highway and said it "hurt her heart" to see the damage along the way — but that she was also glad to see so many businesses back open along the island chain. She said she hopes their presence will help workers pay to fix their homes or find new ones. "They need our help," she said. "And if that is by tipping a little extra this week, then it's doing that." 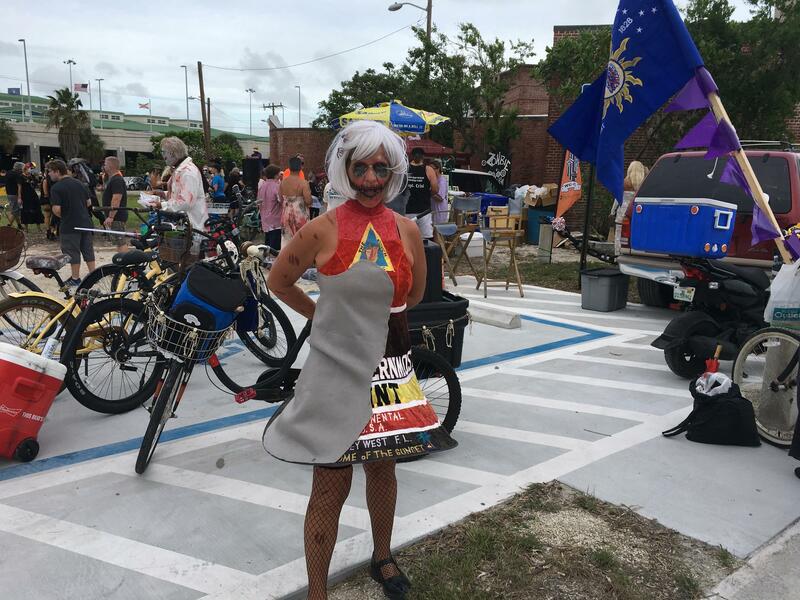 Carol Christman of Key West was wearing a dress modeled after the iconic Southernmost Point buoy — but she added a gray patch where the hurricane scoured away the paint. She said Key West was ready for a party after the storm and clean-up. Christman works at a guesthouse in Key West and on a catamaran that takes tourists to the reef. Getting tourists back to the Keys has been a top priority, from the local level to the Statehouse. Gov. 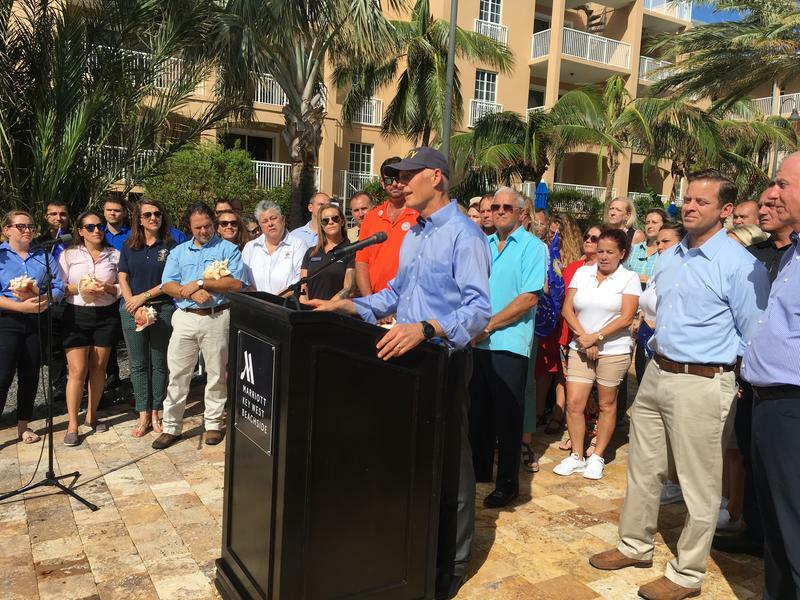 Rick Scott was in Key West early this month to drive that message home. Less than two weeks after Irma crossed the Keys, the Monroe County Commission approved $1 million in emergency advertising by the county’s Tourist Development Council to send the message that the Keys are open for business. Ads started running on television, radio and digital outlets, nationally and targeting major markets for the Keys. Some of those pieces, though, aren’t quite all the way picked up yet. 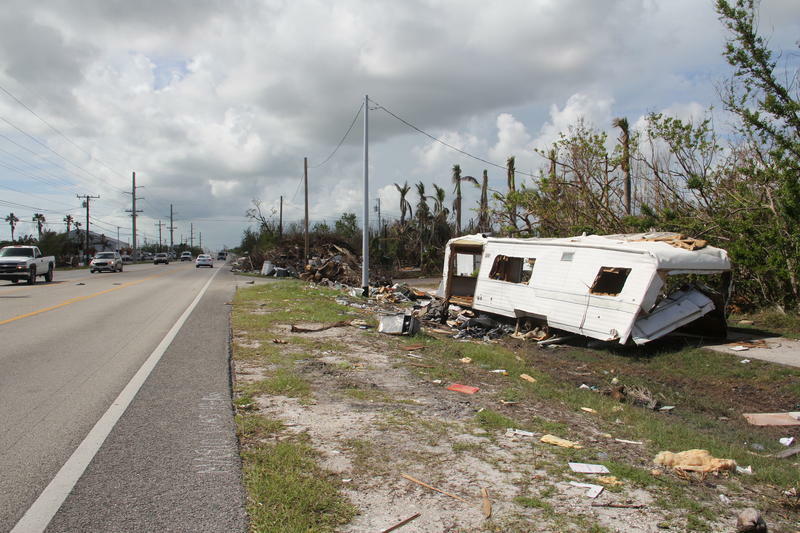 Visitors driving to Key West down the Overseas Highway will see massive piles of debris and evidence everywhere of the damage that a Category 4 hurricane can do. Some people who live in the Lower Keys are not happy with the push from Key West to bring back tourists so soon. “We’ve had buses going through and taking pictures,” said Jim Ensminger, a retired firefighter who lives on Big Pine Key, about 30 miles from Key West. His house did OK in the storm, but his neighborhood saw some of the worst damage. 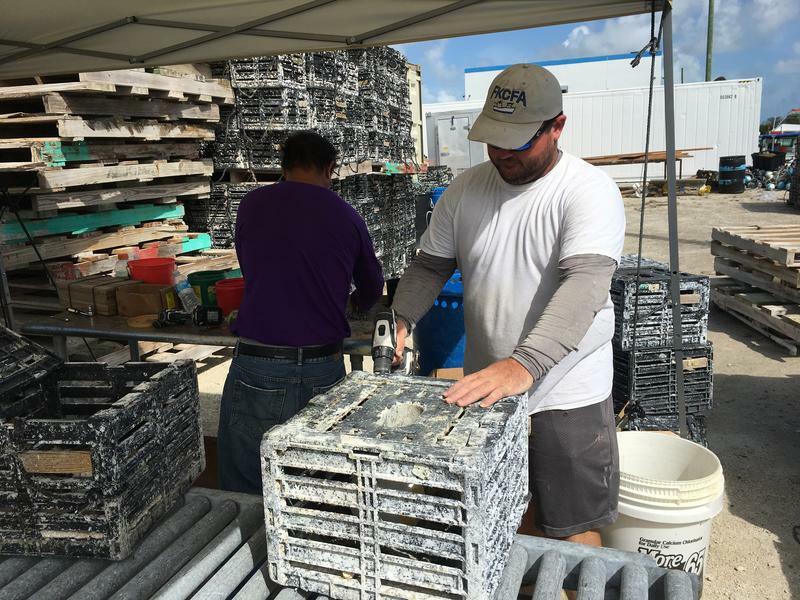 Ensminger said Key West’s relatively quick recovery is impressive – and those resources should be dedicated to helping the harder hit areas. Prioritizing those resources – rebuilding damaged areas and bringing back tourists – is the challenge the Keys are facing now. “It’s obviously a conundrum – what comes first, the chicken or the egg. The problem is, they’re both going to have to come at the same time,” said Andy Newman, who handles public relations for the Keys tourist development council. The TDC collects a 4-cent tax on tourist lodging in the Keys and spends it on advertising, events and capital projects that benefit tourism. Tourism is big business in the Keys even for a relatively small part of the South Florida economy. Monroe County has 75,000 residents – but 5 million people visit every year. Newman said the push to bring tourism back is part of a long-term strategy. Every year in late October, tens of thousands of people visit Key West for the 10 days of parties and parades known as Fantasy Fest. It's the island's biggest event of the year, and it fills hotel rooms, bars and restaurants. But it also costs the city more than $280,000 for clean-up and policing. There are a lot of mystery books set in Key West. And now there's a new addition to the list: Killer Takeout, the seventh installment in the Key West Food Critic Mysteries. 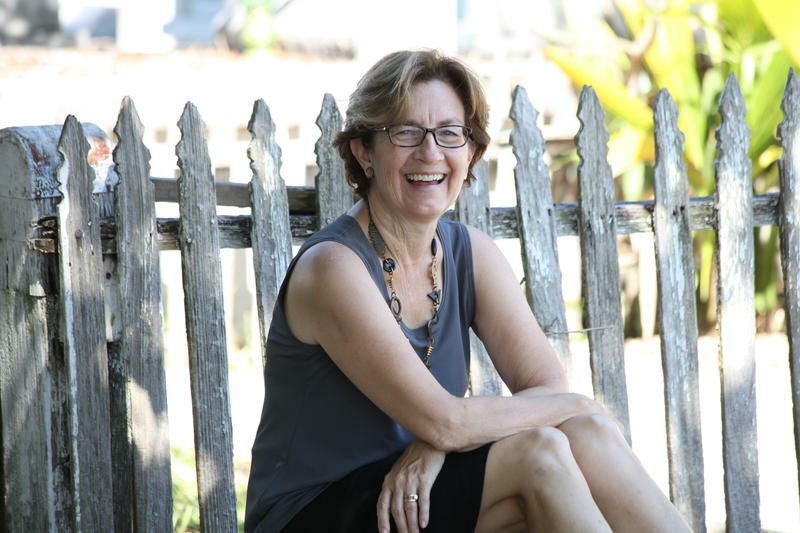 The series is by Lucy Burdette, pen name for Key West resident Roberta Isleib. She recently spoke with WLRN's Nancy Klingener about the new book and about the series. What are the Key West Food Critic Mysteries?